This over-stuffed gourmet gift basket is filled to capacity with nothing but delectable desserts, cocoas, and flavored coffees. 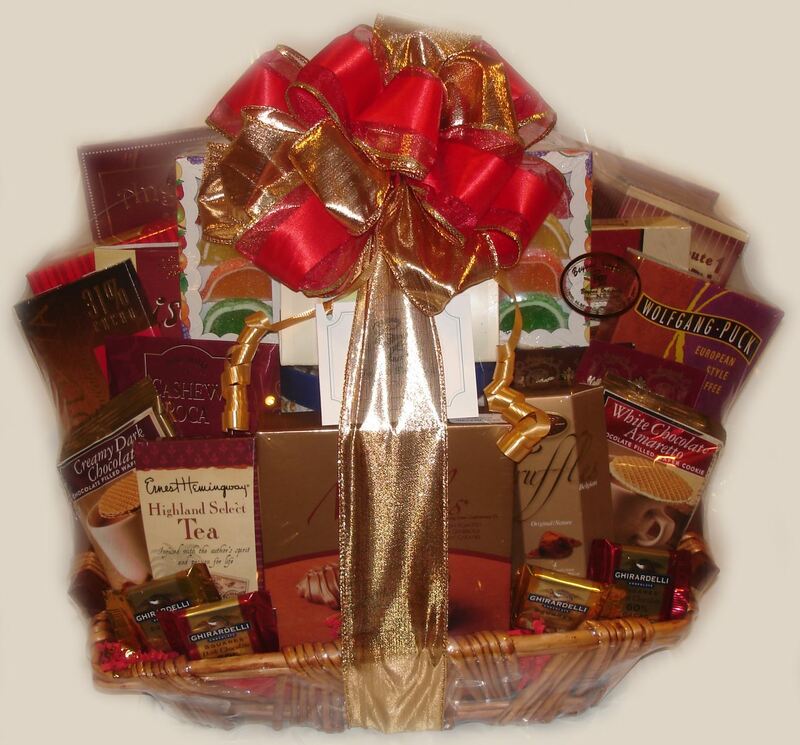 Give the recipient their ‘Just Desserts’ with our over-stuffed gourmet gift basket filled to capacity with nothing but delectable desserts, cocoas, and flavored coffees. This is an ideal office gift, as well as, an individual gift. The red gold hues make this the ideal gift all year ’round. Makes an excellent hostess or party gift, too. Includes Exquisite Pralines, Peppermint Roca, Milk Chocolate-Covered Peanut Clusters, Chocolate-Filled Crepe Pastries, Cashew Popcorn, Harvest Dried Fruit Medley, Cranberry Cookie Straws, Double-Chocolate Meltaways, Cashew Roca, Belgian Truffles, Ghirardelli Chocolates, Godiva Chocolates, Milk Chocolate-Covered Peanut Clusters, White Chocolate Amaretto Cookie, Chocolate Crunch Cookie, Chocolate Double-Dipped Peanuts, Tiramisu Wafers, Vanilla-Filled Wafer Rolls, Chocolate Chip Pecan Cookies, Caramelized Cookies, Sweet Buttery Cookies, Godiva Truffle Coffee, Tea, Cocoa, and European Coffee.